The top panels are scans from confocal microscope experiments, showing the different aggregation patterns of colloidal particles. The bottom panels represent the computer generated three-dimensional structures, where every sphere represents a colloidal particle. Particles in a crystalline environment are coloured in red, to emphasize their abundance in the crystal-gel structure. Image: Dr John Russo, University of Bristol. 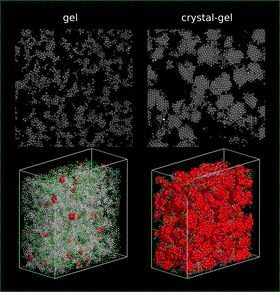 Scientists at the University of Bristol in the UK have, for the first time, observed the formation of a crystal gel with particle-level resolution, allowing them to study the conditions by which these new materials form. The study showed that the mechanism of crystal growth follows the same strategies by which ice crystals grow in clouds, an analogy that could improve our understanding of these fundamental processes. In addition, the novel mechanism allowed the research team to spontaneously form sponge-like nanoporous crystals in a continuous process. Nanoporous crystals of metals and semiconductors can be obtained without dealloying, which can be important for catalytic, optical, sensing and filtration applications. The work is a collaboration between the University of Tokyo in Japan (where the experiments were conducted), the University of Bristol and the Institute Lumiere Matiere in Lyon, France. The findings are published in a paper in Nature Materials. "In particular we observed some new formation mechanisms," said John Russo at the University of Bristol's School of Mathematics and co-author of the paper. "We discovered that in order to obtain these crystal-gel structures, the original gel structure has to undergo a structural reorganization, in which bonds between colloidal particles are broken to release the internal stress that was accumulated during the rapid growth of the gel – a process called stress-driven aging. "After this, we observed that the way the branches of the gel crystallize is reminiscent of the process by which water droplets crystallize in clouds. We were then able to observe processes that promote crystallization through an intermediate gas phase. This is the first time these fundamental processes are observed at a particle-level resolution, which gives us unprecedented insight over how the process occurs." The paper reports the results of experiments on an out-of-equilibrium phase of matter obtained by mixing micrometer-size colloidal particles with short polymer chains in a good solvent. The role of the polymers is to induce an effective attraction between the colloidal particles, due to a physical effect called depletion, whose origin is purely entropic. At the beginning of the experiment, colloidal particles repel each other due to electrostatic repulsion. In order to induce depletion attraction between the colloid particles, the sample is put in contact with a salt solution through a semi-permeable membrane. As the salt diffuses through the semi-permeable membrane, it screens the electrostatic repulsion between the colloidal particles, which then start to aggregate. The whole process of aggregation is observed with a confocal microscope, which takes fast scans of the sample at different heights. This allows the researchers to reconstruct the coordinates of the colloidal particles with image analysis, and study how these particles move over the course of several hours. If the polymer concentration is high, the system will form a gel – a disordered state in which colloidal particles aggregate to form interconnected branches that span the whole system, and that give rigidity to the structure. "What we have demonstrated, instead, is that if we tune the polymer concentration at right value (next to what is called a critical point), the system will form a different type of gel, in which the colloidal particles crystallize throughout the gel structure, giving origin to a porous material made of crystalline branches," explained Russo. This story is adapted from material from the University of Bristol, with editorial changes made by Materials Today. The views expressed in this article do not necessarily represent those of Elsevier. Link to original source. Scientists have witnessed exotic superconductivity in the material ytterbium-bismuth-platinum that relies on highly unusual electron interactions.